Jeep is sometimes referred to as one of the most “patriotic” vehicle brands, and for good reason: Jeeps are often credited with helping the allies to victory during World War II. It’s one of the Jeep’s later gigs however, that perhaps cemented the Jeep’s image of tenacity and pluck. We’re talking about the “Dispatcher Jeep” and its role with the U.S. Postal Service. 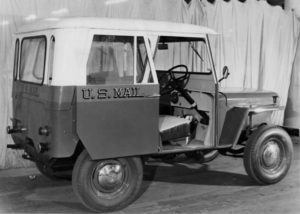 Before the Jeep showed up, the U.S. Post Office (USPS) initially relied on horse-drawn carriages, and then a mishmash of steam-, electric-, and gasoline-powered vehicles. The Post Office had no vehicle standardization in the first half of the 20th century , and it caused a ton of frustration with mechanics in the motor pools. In fact, as this article from the Smithsonian explains, the Post Office at one point owned 4,000 vehicles between 43 models and 23 different manufacturers. Through the 1930s, the USPS slowly began streamlining its fleet of trucks to just a few manufacturers, but as World War II hit, focus shifted to the war effort. After the war, the Post Office finally had the budget to start buying new vehicles to update its ragtag fleet. The first vehicles the USPS chose were dubbed “Sit or Stand” trucks, aptly named because the driver could sit or stand during transport. Then, Post Office officials discovered a rugged design from a company called Willys. To the public, Willys first marketed its Civilian Jeep (CJ) as an agricultural tool similar to a tractor, but the company soon began to explore other opportunities. Seeing the Jeep’s potential as a delivery vehicle, Willys simplified the already-spartan CJ by eliminating its four-wheel drive capability. It also added a column-shift option and an assortment of body styles, including a fully-enclosed panel van configuration. The folding windshield, now unnecessary, was eliminated. The result was the “Dispatcher Jeep” or DJ, for short. The DJ series began as a variant of the CJ-3A, simply called the DJ-3A. As its predecessors did on battlefields a decade prior, the DJ quickly proved itself to be a rugged, reliable asset on the nation’s dirt roads and snow-covered streets—the Post Office had finally discovered its workhorse. As the Civilian Jeep line evolved, so did the DJ, eventually adding DJ-5 and DJ-6 models. (There was even a limited run of Scrambler models made for the Alaskan Post Office.) DJs destined for mail service were usually right-hand drive to facilitate access to residential mailboxes. DJs also got a large sliding door, plus an assortment of mirror and lighting fixtures to aid them in their mail-delivering task. It’s important to realize that, technically speaking, the DJ wasn’t always built by “Jeep.” To understand how that came to be, let’s try to understand the Jeep brand’s lineage along the Willy-Kaiser-AMC family tree. Willys originally made the Jeep, but the company was soon bought by Kaiser in 1953. The new corporation was first called Kaiser-Willys, then it changed to Kaiser-Jeep. Next, AMC bought the Jeep division from Kaiser in 1970 and Kaiser got out of the automobile business altogether. To handle the fulfillment of Kaiser’s previous military truck contracts, AMC created a subsidiary called AM General in 1971. Then, Jeep DJ production moved under the umbrella of AM General. Finally, when AMC was purchased by French-owned Renault, U.S. government regulations said that foreign companies couldn’t fulfill defense contracts. Under those terms, AM General was sold separately to the U.S.-based LTV Corporation. 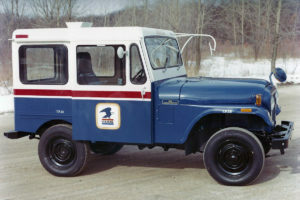 As the Dispatcher Jeep entered the 1980s, the Post Office was already engaged in a search for a versatile replacement. 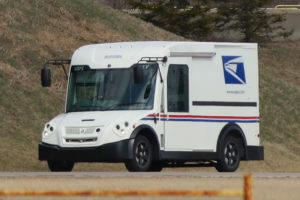 Instead of picking an off-the-shelf vehicle and tailoring it to mail delivery, the USPS called for a unique truck suited exclusively for the task. The LLV is the truck most folks born after 1990 are familiar with. Rugged and versatile, Grumman (a company that also helped build the Apollo Lunar Module and F-14 Tomcat fighter jet) created the LLV with an expected service life over 20 years. Though it was a largely one-off design, the LLV’s chassis is based off an early Chevy S-10 Blazer. Most LLVs are powered by the venerable “Iron Duke” Pontiac 2.5L engine connected to a light-duty Turbo-Hydramatic 180 transmission. 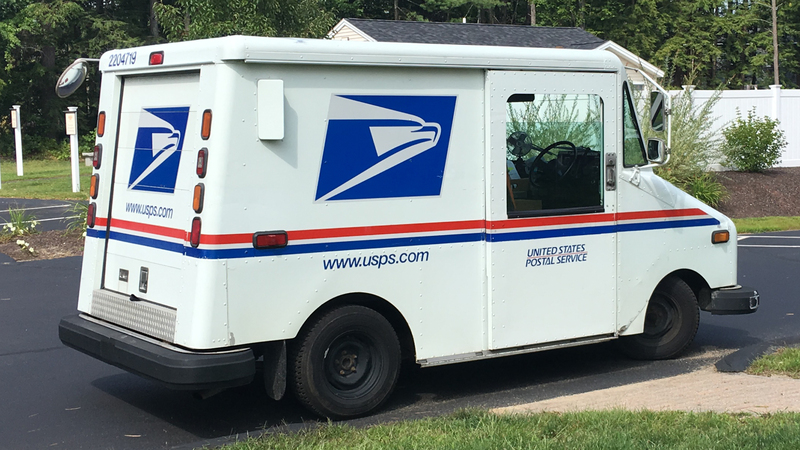 The oldest Grumman LLVs are reaching beyond their expected service life, and the Post Office has once again started searching for a new mail delivery vehicle. While it’s unlikely that you’ll see a new Jeep Wrangler delivering your mail in the future, carriers have used some off-the-shelf vehicles (like panel-wagon versions of minivans) in their fleet. 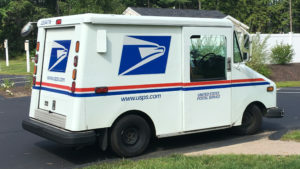 The reality is the Post Office is searching for a unique vehicle that expands the Jeep’s and LLV’s legacy. Early prototypes have teased gasoline, hybrid, and all-electric drivetrains—all with the expectation of long service intervals and anvil-like reliability. Similar to their CJ counterparts, DJ-series Jeeps have a growing collector’s market. The fact that the DJ shares so much of its chassis and running gear with other vehicles can make it easier to repair/restore than other niche automobiles. Better still, one of the core tenets of the DJ Jeep was serviceability, which means that Dispatchers are relatively easy to wrench on, without breaking your budget. The problem with Jeep DJs (like the CJ) is rust. The days of scoring a cheap junkyard DJ are long gone and finding one in a farmer’s field that hasn’t returned to Mother Earth is nigh impossible. If you’re looking to restore a DJ, start with the best body/frame possible. Drivetrain, chassis, and suspension issues can usually be resolved with much greater ease than, say, a frame repair or the need to custom-fabricate body panels. You forgot to mention the Studebaker “Zip Van”. Manufactured in South Bend, Indiana. 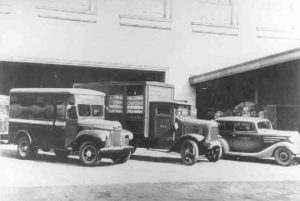 Yes, the mail vehicle family tree certainly has a lot of fascinating branches like the Zip Van–unfortunately, we couldn’t include all of them in the article. It’s interesting to note, as seen in the initial photo above, that AM General (nee AMC) DJ production actually took place in the old Studebaker plant. That’s because Stude’s “General Products Division” was bought by Kaiser-Jeep as Studebaker began to fold in the 1960s. Then, when AMC bought Kaiser, it kept the South Bend assembly line humming with DJ production. I worked two summers, one for the US Post Office and one for the newly-reorganized US Postal Service. The DJs were showing their age at the time but were generally reliable (and noisy). Two things had to be watched carefully — the transmission could vibrate itself from “Park” to “Drive” and roll away despite the handbrake being set, and the latches for the sliding door didn’t always latch properly. Coming to a stop while running with the door open could get noisy and clip your elbow. The sliding windows tended to stick and it was easier just to run with the door open. Around 1970 I bought a 1960 Jeep RH drive stand/sit van by sealed bid from the Post Office for $76.01. I used it for several years to haul to the dump and even drive to work sometimes. The engine would scream on the interstate but never had a problem with it. The color photo at the top of the article shows both white and blue DJ’s on the South Bend production line. Why were both colors produced at the same time? What determined which color scheme was sent to a specific post office branch? I thought the USPS switched from blue to white at some point but did not maintain both color schemes as new production. Insights on this issue? Thanks. Knowing the P.O., They probably bought enough of the post office blue, ran out & had to go with white, who knows they have been changing things around unnecessarily on lots of stuff that could have been kept original & saved a lot.Of course I understand the times they are a changing.I guess my point being the place knows how to waste money! I’m all for the environment, sustainability and all that & saw areas for major improvement where they could do more for the community.For instance the annual food drive is just an example of the positive.They can do more and I for 1 wish they would.Thats enough of ranting & going of on a tangent. So,back to the jeep, those were what I trained on and drove the years I was a carrier, and by the way if you know of any I would love to get one! I’ll do the work myself! I guess if I’m lucky hopefully I’ve still got a few good years left! Here in FL the Postal Service declined to auction the last few DJ’s but instead sent them straight to the junkyard, with instructions to cut them up and not sell for parts. Sort of like the M-151 Ford. Unsafe for the general public, but they were ok for Postal workers (or in the case of the M-151, for the military). I don’t think there are any of them being used anymore for Rural Route/Box Delivery but you do see the occasional rusty one around. 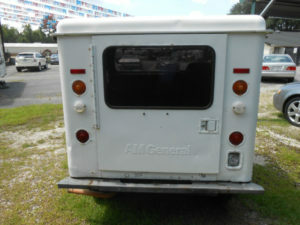 I imagine they will not auction off the LLV’s either: too closely related to the Postal Service. DJ were used in Toledo as pizza delivery vehicles – years before Domino’s DXP “Ultimate Pizza Delivery” vehicle was even a gleam in a marketer’s eye… . Jo Jo’s Pizza (founded in 1957, still in business today) used DJ’s painted in medium green as their “Pizza Patrol” delivery vehicles. And how about an article on the last Post Office car – wasn’t some RH drive Saturn SL wagons offered as rural postal delivery vehicles? LLV’s did not come with turbo 350’s. They had the French made turbo 200, metric trany in them. I was a mechanic at the Post Office. We replaced the 200’s with TH 350’s later on. Hey Henry, you’re right. We dug a bit deeper and actually found the designation to be TH180. We made the update in the story–thanks for the heads up! I’ve worked for the USPS since 1989 . I remember the old Jeeps -1/4 and half ton’s. I took a then brand new LLV with less than 50 miles up to 100 mph on Route 9 in CT when we first got them . I’ve heard the reason Grumman got the contract is the US Navy had just cancelled their run of F-14 fighters, this was the pay off . What most people don’t know is when the USPS cancelled another run of the LLV, Grumman destroyed the body tooling. That’s when the Grumman logo came off the trucks, wish I had stolen one . I have a copy of The Grumman LLV owners and service manual . They are too small and too inefficient . Mine gets 8 mpg ,never driving over 50 mph-driving 28 miles a day . In 1998, the PO where I worked (west side Detroit suburb) acquired a bunch of white with red/blue striping Ford Windstars, which were neither “LX” or whatever trim levels Ford offered to non-fleet buyers… The were badged Windstar “3.0” and what they were was totally stripped. No A/C, no carpet in the back, just rubber mat. I thought it odd that they didn’t use rubber mat in the front, because most of the “streets” in this suburb were dirt… meaning mud in the winter. The carpet in those vans became pretty nasty. The Windstars did not even have a radio, nor the dash-mounted oscillating fans we had in the LLVs. They were suffocatingly hot in the summer. I do remember setting the heater control to “coldest” and the heater fan to “hi” to blow warm air from the dash vents, to try to get the hot air out of the car. I also remember one of the funnest things for me was taking them “off-road” into the mud, setting the hand brake, and flooring the throttle while steering full left and right lock. I was able to completely cover them in brown mud, which was fulfilling after a day of trudging through the snow and being attacked by dogs. 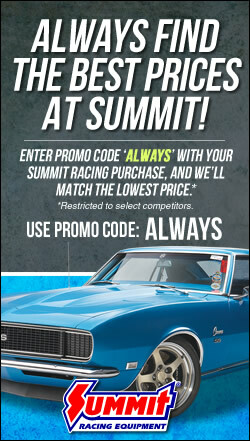 You’d think by now they would invest in 4×4″s for us New Englanders, not to mention the other snowy parts of the country! Don’t forget the 1967 Right Hand Drive AMC Ambassador Postal Delivery Cars! Now THAT^^^ is cool, Thanks Jeff–I learned something new! Kids would come out to great me, jump on the back for a block.We would shoot rubber bands at each other, on Saturdays I was the one to wait for. 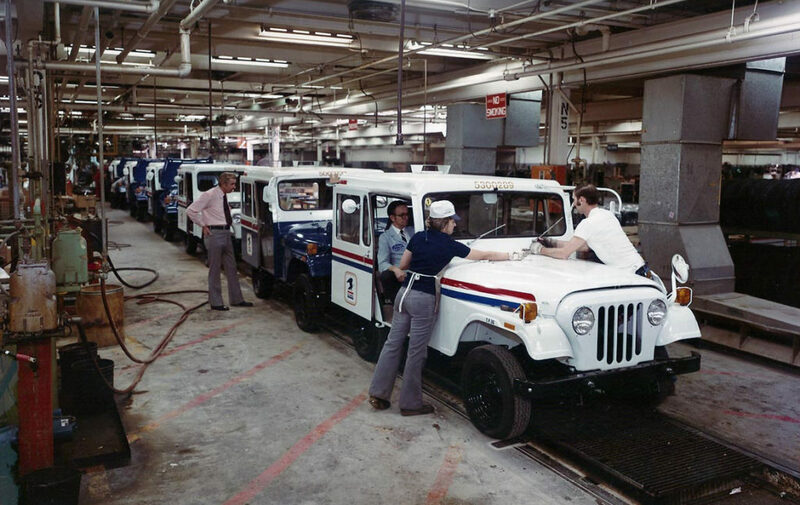 I contracted the mail so I could do what I wanted with the jeeps I bought, the only cool Jeep I ever saw. Hi. I saw comment on Studebaker zip and understand space limitations but the 1960-65 Jeep FleetVan built on Dispatcher is a neat postal vehicle.